We got back to Lone Bobcat Woods in early March, and are having a pretty rough re-entry. While we were gone someone stole our well pump generator — so no water except what we can schlepp. Two other generators weren’t working — so no electricity. The printer died, and likewise its backup twin. Then our propane system failed giving us no heat and half the cookstove flame. A lot of hurdles and a lot of stress. The electricity generators are now working, and likewise a replacement printer. Propane is still temperamental. But hurrah, we now have water! Miraculously, Robin found a missing electrical part under layers of leaves. Even after a winter or two of rain, it still works. Meanwhile, Robin has had near-daily heart palpitations which sap her energy and has us both very concerned. The good new is in January she began working with a functional medicine doctor, who recommended an herbal tonic which calms her heart. Tests show she has some nasty bacterial parasites in her gut that may be underlying her auto-immune symptoms. She will be on a pretty hefty anti-parasite herbal protocol, in which I have to join her, in case we’re transmitting it to one another. Also on the plus side, but with mixed feelings, we’ve entered escrow to sell our house. Our tenant made the offer last December. Although we feel loss for this sweet homestead we’ve put so much of ourselves into, it’s also a relief. Upkeep was getting to be more than we could maintain. And we aren’t leaving Lone Bobcat Woods. When not on the road, we live in our motorhome on an adjoining parcel, beside a meadow and spring, with our community — the nesting birds, migratory deer and turkey, and occasional bear. 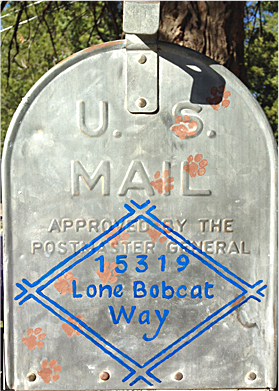 And we have a new mailing address: 15319 Lone Bobcat Way, Nevada City, CA 95959. We want to find an additional home base, probably in the Pacific Northwest, especially during the hot and wildfire seasons. It’s also Robin’s home region. We’ve purchased a used shipping container to store our belongings. Now we’re moving things out of one room in the house to meet an end-of-May deadline. We’re downsizing, but it’s a challenge to decide what to keep when we don’t know the destination and thus what we may need. We’re stepping into the biggest uncertainty we’ve known. We don’t know where we’re going or when. We certainly plan to continue our travels, producing Peak Moment shows and visiting other areas of North America. We feel like we’re in a moment like “Raiders of the Lost Ark” when the adventurer, having successfully made it through the tricky steps of the maze, finds himself at an opening high up on a rock precipice overlooking an abyss. His instructions direct him to step forward, but to do so would mean falling to certain death. Gathering his courage, he does step forward. A ledge suddenly swings out of the rock, stopping just under his foot. It bridges the rock walls and leads to another doorway. When the need is there, the way appears. We’re standing near the edge of a precipice. We are letting go of a home that is very much a part of us. We trust that the path will be shown at each step, as it has many times before. Sorry to hear about these challenges! Knowing your faith has carried you this far, may the adventure continue in health and grace!